Emergency rooms are seeing a jump in opioid overdoses. 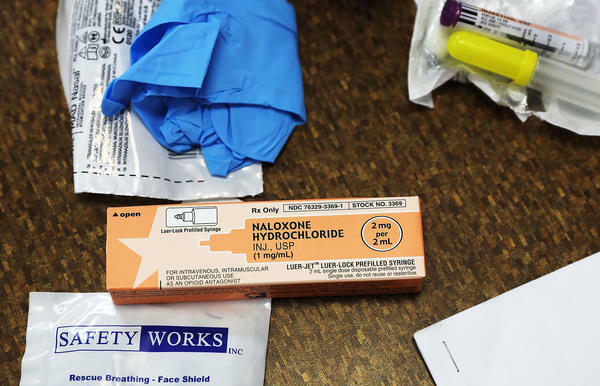 Timely treatment with naloxone can reverse the effects of opioids. There's more bad news about the nation's devastating opioid epidemic. In just one year, overdoses from opioids jumped by about 30 percent, according to a report released Tuesday by the Centers for Disease Control and Prevention. The overall increase in opioid overdoses seen in hospital emergency rooms between the third quarter of 2016 and the third quarter of 2017 occurred across the nation. Some parts of the country experienced far greater increases, while a few have reported declines, the analysis shows. "We have an emergency on our hands," says acting CDC Director Anne Schuchat. "The fast-moving opioid overdose epidemic continues and is accelerating." The largest regional increase occurred in the Midwest, which saw a 69.7 percent jump in opioid overdoses, according to the report. The jump was driven in part by a 109 percent increase in Wisconsin. Overdoses increased 40.3 percent in the West, 21.3 percent in the Northeast, 20.2 percent in the Southwest and 14 percent in the Southeast. "We saw, sadly, that in every region, in every age group of adults, in both men and women, overdoses from opioids are increasing," Schuchat says. The latest data could underestimate the overdoses, because many people who overdose never end up in the emergency room. "It might be even worse," Schuchat says. The report didn't specify why overdoses vary across the country. But one factor is probably the differences in availability of newer, highly potent illegal opioids, such as fentanyl, which have been flooding the country in recent years, Schuchat says. "We think that the number of people addicted to opioids is relatively stable. But the substances are more dangerous than five years ago," Schuchat says. "The margin of error for taking one of these substances is small now and people may not know what they have." The supply of those more dangerous drugs is increasing faster in some parts of the country than in others, which may help explain the geographic variations, Schuchat says. "Overall as a nation, we are still failing to adequately respond to the opioid addiction epidemic," says Dr. Andrew Kolodny, co-director of opioid policy research at Brandeis University. "It is concerning that 20 years into this epidemic, it is still getting worse. The number of Americans experiencing opioid overdoses is still increasing." Although the Trump administration recently declared the epidemic to be an emergency, a significant increase in funding is urgently needed to treat Americans addicted to opioids. Kolodny says. "It's kind of like pointing to a burning building and saying, 'Oh, there's a fire there. There's an emergency.' And then not calling the fire department and watching it burn down," Kolodny says. "There's been a lot of talk from Congress and from the administration and a recognition that we need to do something about this problem. But nothing yet has happened." Others say the key is integrating addiction treatment better into the health care system. For example, emergency room staff need better training to make sure people with substance-use disorder get follow-up addiction treatment, says Jessica Hulsey Nickel, president and chief executive officer of the Addiction Policy Forum. Too often, addicts are simply revived and sent home without follow-up care, only to overdose again, she says. "We can use this near-death experience — use it as moment to change that person's life," Nickel says. The latest analysis is an attempt by the CDC to track the opioid epidemic more closely, Schuchat says. Previously, the agency looked at death from opioids, which lag behind reports from emergency rooms. "We wanted more timely information," Schuchat says. The analysis was based on about 91 million emergency room visits that occurred between July 2016 and September 2017, including 142,557 visits that were suspected opioid overdoses. That survey showed an increase of 29.7 percent in 52 jurisdictions in 45 states between July through September 2016 and the same period in 2017, according to the report. The researchers also analyzed 45 million emergency department visits that occurred in 16 states during the same period, which included 119,198 suspected opioid overdoses. That analysis showed a 34.5 percent increase between the same periods in 2016 and 2017. But those increases varied dramatically from state to state, even within a region. For example, overdoses increased 105 percent in Delaware, compared with 80.6 percent in Pennsylvania and 34 percent in Maine. Overdoses may have actually slightly decreased in Massachusetts, New Hampshire and Rhode Island. In Kentucky, the CDC's analysis showed a 15 percent drop in overdoses. Today - two new reports about opioids. In a moment, we'll hear about the first long-term study looking at how effective opioids are treating common kinds of chronic pain. First - news about opioid overdoses. The number of Americans who are overdosing on fentanyl, heroin and other opioids shows no sign of slowing down. In fact, according to the latest data from the Centers for Disease Control and Prevention, it's getting worse. NPR health correspondent Rob Stein has the details. ROB STEIN, BYLINE: Americans have been struggling with the opioid epidemic for years now, so you'd think things might be finally starting to get better. It's not. In fact it's never been worse. ANNE SCHUCHAT: The news overall is bad. STEIN: That's Anne Schuchat, the CDC's acting director. SCHUCHAT: The fast-moving opioid overdose epidemic continues and is accelerating. It's getting worse. STEIN: Emergency rooms around the country are reporting that overdoses jumped sharply between 2016 and 2017. They're up an eye-popping 30 percent. SCHUCHAT: We have an emergency on our hands. This emergency room data is a real wakeup call for the nation. STEIN: The jump in opioid overdoses is hitting coast to coast, from Delaware to California. SCHUCHAT: We saw sadly that in every region, in every age group of adults, in both men and women, overdoses from opioids are increasing. STEIN: But some parts of the country are being hit harder than others. SCHUCHAT: The Midwestern region was most hard hit with an increase of 70 percent. STEIN: That's right. She said overdoses spiked 70 percent in Midwestern states like Illinois, Indiana and Ohio. In Wisconsin, overdoses are up a 109 percent. Schuchat blames the increase on newer, more potent opioids like fentanyl flooding into some parts of the country faster than others. SCHUCHAT: We think that the number of people addicted to opioids is relatively stable, but the substances are more dangerous than, you know, five years ago. The margin of error for taking one of these substances is small now, and people may not know what they have. STEIN: Other experts say the latest data are alarming. Andrew Kolodny is an addiction policy expert at Brandeis University. ANDREW KOLODNY: It is concerning that 15, 20 years into this epidemic, it is still getting worse. Overall as a nation, we are still failing to adequately respond to the opiate addiction epidemic. STEIN: That's despite the epidemic getting lots of attention from the highest levels of government. President Trump recently declared the epidemic a national emergency. And just last week, he held a high-profile summit on the epidemic at the White House. KOLODNY: And yet nothing has happened. It's kind of like pointing to a burning building and saying, oh, there's a fire there; there's an emergency, and then not calling the fire department and watching it burn down. STEIN: Kolodny says the nation needs billions of dollars to provide treatment for the millions of Americans struggling with their addiction. Others say one key could be training emergency room doctors and nurses to make sure addicts get help to break their addiction. Jessica Hulsey Nickel heads the Addiction Policy Forum. JESSICA HULSEY NICKEL: We can use this near-death experience - use it as a moment to change that person's life. STEIN: Too often, she says, addicts are simply revived and sent home only to overdose again. Rob Stein, NPR News. Transcript provided by NPR, Copyright NPR.